Using the Charlotte Mason Homeschool Method for ADHD - Look! We're Learning! In general, we practice an eclectic homeschooling style in our family. We tend to collect resources from all kinds of teaching styles and use them as we see fit. But – if I had to choose a single approach to follow, it would probably be the Charlotte Mason method. We use more elements of this homeschooling approach for our kids with ADHD than we do of any other style. One of the reasons I love the Charlotte Mason homeschool method is because it follows some of the basic guidelines for homeschooling kids with ADHD in the first place, including short lessons in language arts, a relaxed approach to science and handwriting, and an emphasis on multi-sensory learning. But we still have to make a few adjustments for our kids. 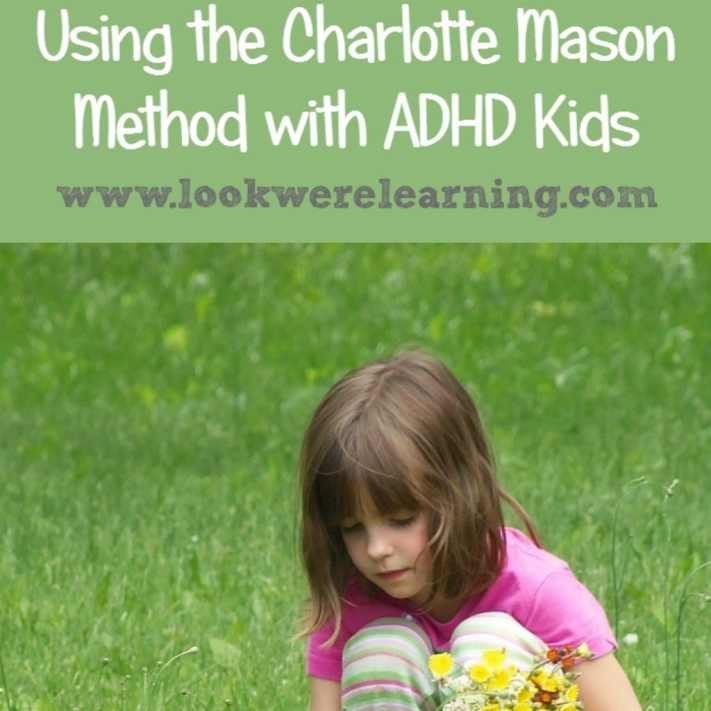 Here’s a look at how I adapt the Charlotte Mason homeschool method for ADHD kids! 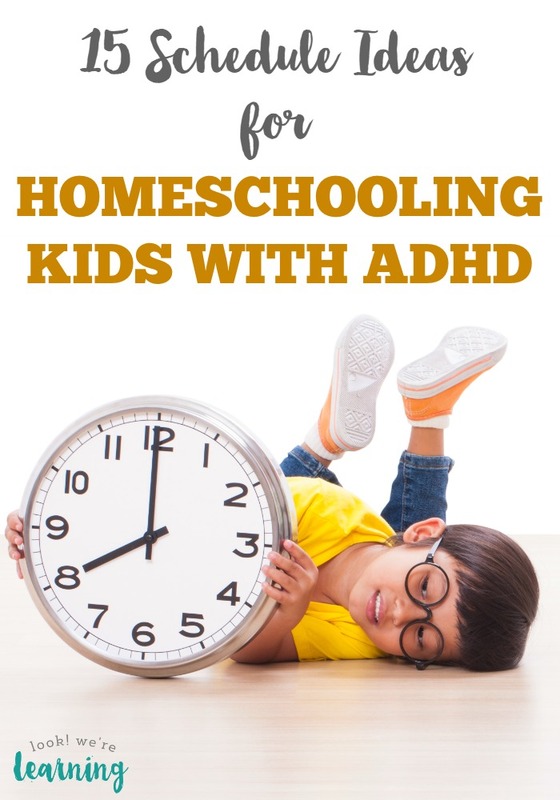 And if you enjoy this post, don’t miss my list of ADHD homeschool schedule ideas that may work for you! Charlotte Mason believed in keeping subject lessons short. Her belief was that kids should cover multiple subjects in a single day – sometimes 10 or more. Naturally, I don’t try to cover 10 subjects each school day with my kids. I do stick with the short lessons, however. Mason called for 15-20 minutes in grade school and 30 to 45 minutes in high school. We’ve found that those subject lengths are ideal for our kids. But instead of covering as many academic subjects as she suggests, I replace several of them with brain breaks that we scatter throughout the day. By the way, if you’re unfamiliar with the Charlotte Mason method, the book “A Charlotte Mason Education: A Homeschooling How To Manual” is an excellent introduction. Rather than teaching spelling, penmanship, and grammar separately, Charlotte Mason combined them into two main disciplines: copywork and living books. Daily copywork has been a lifesaver in our house. We literally begin every school day with it. Charlotte Mason tended to use literature excerpts or scriptures from the Bible as the basis for her copywork. We copy one scripture or part of a scripture per day. I have all of the kids write the same verse. (Tigger writes it once in print and once in cursive.) I copy the verse on the chalkboard and leave it there until everyone is finished. Since kids with ADHD tend to rush through their work, I deliberately shorten the assignment so that we can focus on writing neatly, rather than writing for length. Pooh generally has to write his twice, because he still insists on rushing through it, but we’ll get there! Reading “living books” is a cornerstone of the Charlotte Mason method. Mason believed that children should read books that were of high literary quality and stay away from what she called “twaddle”. I don’t hold to that standard as strongly. I think that a little twaddle now and then can give kids a break from concentrating so hard, which is sometimes exactly what the ADHD brain needs. But we do read literary classics with the kids. To keep their interest, I try to find editions of books such as The Wind and the Willows that have pictures inside. As above, I also keep the reading times short, no more than 15 or 20 minutes for a read-aloud session. They look forward to storytime every afternoon! I have to admit: I am not a huge fan of the outdoors. I believe strongly in protecting the environment and caring for the earth, but I love my couch and my air conditioning. 🙂 So nature study has always been a struggle for me. For kids with ADHD, though, spending time outside can be a natural calming agent. When we do nature study, I try to tie it in with an activity such as making journal entries of our observations or taking pictures of what we see. Our kids always enjoy it! Have you tried the Charlotte Mason homeschool method with your kids? Do you think it’s a good fit for kids with ADHD? Share your thoughts in the comments! 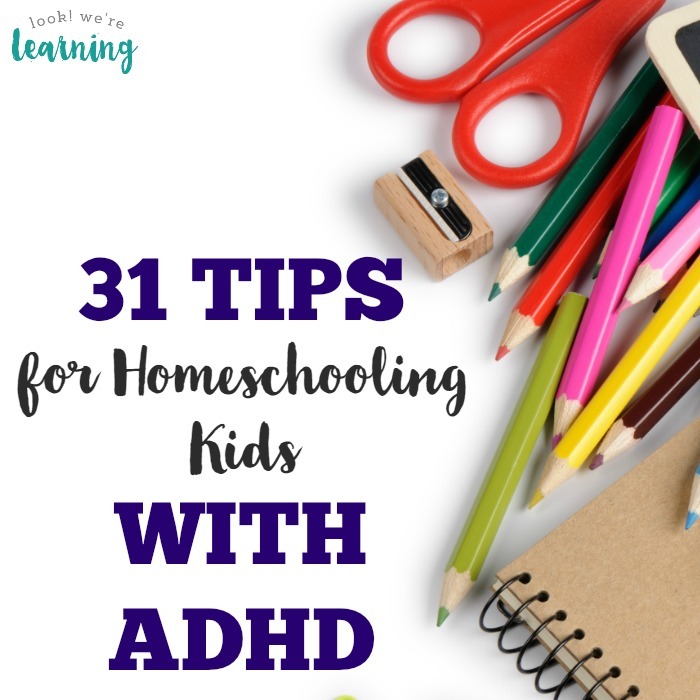 This post is part of our 31 Days of ADHD Homeschooling series! Stop by tomorrow for Day 12: Setting Learning Goals for Children with ADHD! And check out more ADHD homeschooling inspiration below! 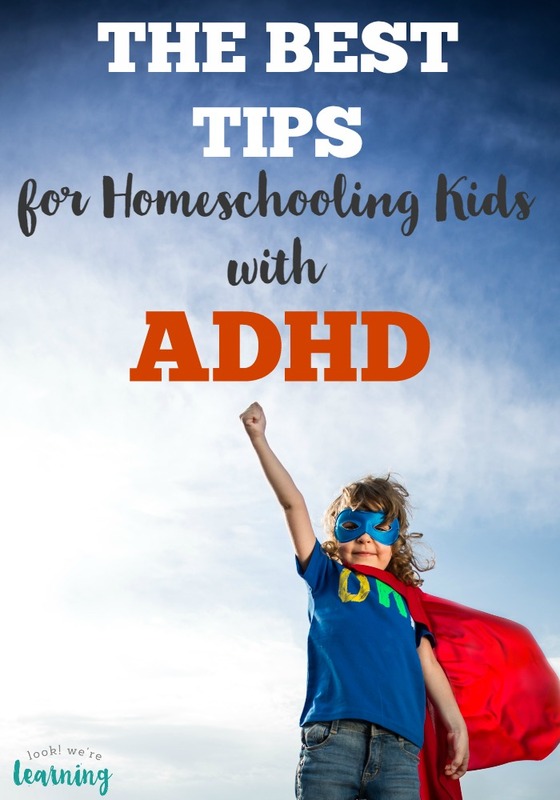 Follow my ADHD Homeschooling Tips board on Pinterest for more suggestions! How do you set the schedule so you teach different things for appropriate age and still manage à toddler at the same time? I have 2 kids, one with add who’s 4 and one with adhd who’s 3 and I want à third baby… Is it possible? Hi Marie! So nice to “meet” you! Charlotte Mason didn’t really recommend structured learning until age 6, so kids at the preschool level don’t have to do much work at all. 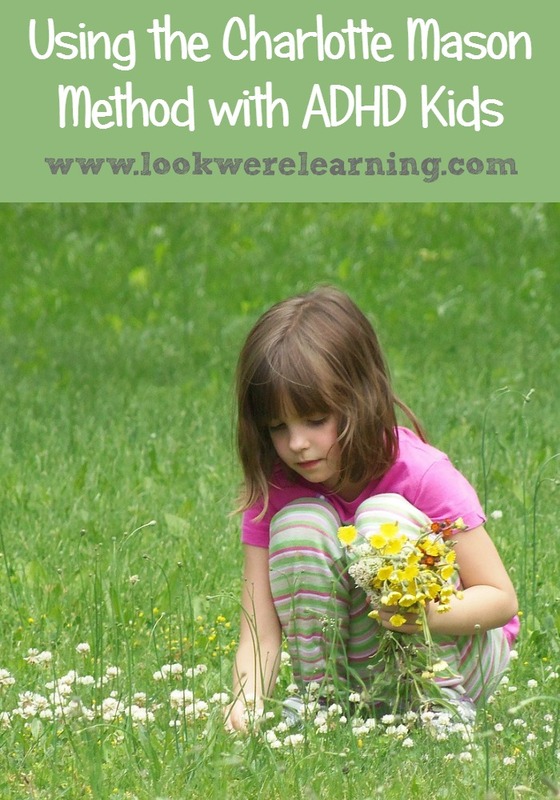 At that age, you can focus on observing nature, reading books together, and open-ended play. It’s when they get older that it becomes more of a challenge…lol. But even at that age, you can still do it. One thing I do is have everyone learn the same subject but in different ways. For example, all three of my older kids might be learning about ancient Egypt, but they’ll read different books about it. My oldest daughter will read something on her grade level, my oldest boy will read something on his level, and I’ll read a younger-level book with my youngest son and daughter. I’ll also assign different activities for each child on the topic. My fifth-grade daughter will probably be required to write a report, but my second-grade son might write a paragraph. My first-grade son will probably draw a picture and a summarizing sentence. Then everyone will share what they wrote. Let me start first by saying, every situation is different. I have an ADHD boy. He is now 11. I have to say that the younger years from 2-8were very challenging. I think it all depends on your support system and how calm you are within. If you are a person who gets stressed easily. I don’t recommend a new baby, not yet. My child started calming down a bit by 7-8. I had a teenager and a toddler who needed lots of attention. But, my ADHD took all of it. So, maybe you can wait a few years. ADHD kids need us calm and lovingly patient. I don’t know how much of that you have right now but, a new baby sometimes changes things drastically. Now, I am homeschooling with a 2 year old, 7 year old girl and an 11 year old ADHD child. Believe me the toddler affects 100 percent because my 11 year old needs constant supervision with his work. He rushes through his work a lot. If I’d let him he would be done in 10 minutes with all his subjects. But, if you don’t want to wait and have the support at home you need just keep in mind every time a big challenge comes up, this too shall pass. By the way, in time the hyperactivity seems to subside a lot. At least enough that it makes a big difference in the family dynamics. I have two outside-the-box children (autism and ADHD & dyslexia) and we have found the Charlotte Mason method to be such a wonderful fit. We, too, have made some adaptations but have seen lots of fruit from approaching education her way :).